The matches against the Blades were one of the few highlights in the 1988-89 relegation season. Another feature of that campaign were the 22 goals in all competitions from Dave Waller. Chesterfield won at the Lane over the new year when Andy Morris with a brace and Bob Bloomer got the goals in the 3-1 victory (see foot of page). The Easter return game at the Rec was one of the first filmed by the Supporters Club for sale to fans. The excited commentary was by John Allen and his role included some unusual interviews with the players, management and directors. The video produced by the Supporters Club has plenty of shots of the crowd and gives a real feel for the Recreation Ground. Of course little changed after this point until the old girl was pulled down. The interviews give one of the few examples of interior film of the stadium. 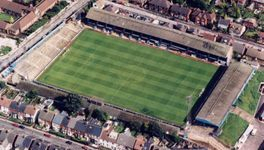 The crowd of 10991 was the last five figure home league attendance at Saltergate and there has been no greater home crowd since, nor is there likely to be unless the Proact is redeveloped. Despite the banter in the dressing room Waller did claim the second goal in front of the Kop for one of his eighteen league goals of the season. This was part of a improved run for Town after Paul Hart replaced Kevin Randall as Manager. However this upturn and Waller scoring in eight successive games was not enough to prevent relegation after the poor start. Our opponents that day, regardless of our double over them, were promoted on the last day of the season. The highlights of the game at Bramall Lane.